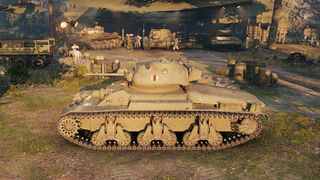 Der AC 1 Sentinel ist ein britischer premium mittlerer Panzer der Stufe 4. Im Jahre 1941 im Rahmen des Programms für australische Kreuzerpanzer entwickelt. Geplant war, 2.000 Fahrzeuge zu bauen, zwischen 1942 und 1943 wurden jedoch nur 65 Fahrzeuge mit den Seriennummer 8001 bis 8065 gebaut. Im Juli 1943 wurde entschieden, die Entwicklung und das Programm einzustellen. Das Fahrzeug wurde nie im Kampf eingesetzt und nur für Ausbildungszwecke verwendet. 1946 wurden sie ausgemustert. 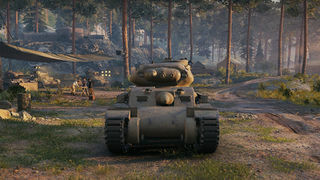 The AC 1 Sentinel is a Tier IV premium medium tank. The tank is the object of derision due to it's poor gun and "distinctive" front machine gun port. 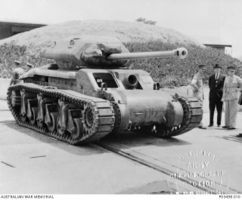 The tank is in the British tech tree as Australia doesn't have it's own tech tree and is part of the British Commonwealth. Poor aim time and reloads faster than it can aim, hurting potential DPM even further unless engaging at point blank range. The AC 1 Sentinel is a great brawling medium tank. With the frontal armor of the Valentine, HP pool of the Matilda, and some of the speed of the Covenanter, it can make aggressive maneuvers on flat ground and take a few hits without turning into a burning wreck. This is especially true in Tier 4 and 5 games. In Tier 6, it is relegated to a secondary role as an anti-scout and flank protector in coordination with allies. In this role, it will have the benefit of a 350 meter view range. Firepower-wise, it has a reasonable DPM and good armor penetration of 88mm. However, its alpha damage of 45 means it will take numerous shots to take out opponents, something partially compensated by its high rate of fire. While comparable British 2-pdr guns on the Valentine and Covenanter can fire more quickly and do more damage, they only have 78mm of armor penetration. This is the difference between punching through a KV-1 or Matilda and not. Therefore, the Sentinel's 2-pdr gun is able to deal less, but more consistent damage. The only 2-pdr gun that beats the Mk X-A on the Sentinel is the 2-pdr Mk. X-B with the Little-John adapter on the Matilda. However, the Matilda does not have the benefit of being able to outflank opponents. It also has great gun depression, though the Covenanter, Valentine, and Matilda are not lacking in gun depression as well. The vehicle is not without faults, however. With an 11.81hp/ton ratio, the Sentinel will struggle up hills and will feel somewhat sluggish on flat ground. While it is better than the Matilda and Valentine, they are really pocket heavy tanks, where the Sentinel is closer to a proper brawling medium. Its gun also has an uncharacteristically long 2.7 second aim time, as comparable guns have aim times closer to 2 seconds or less. Combined with its mediocre gun handling, the Sentinel is very ineffective at long-range combat. 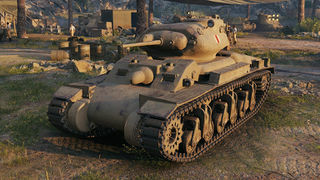 The Sentinel is a good Tier 4 medium tank, capable of holding its own when top tier and supporting allies when its bottom tier with its good combination of protection, mobility, and firepower. It also has good view range, which comes in handy when bottom tier. As this is a premium tank, no research is needed. 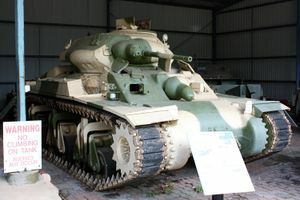 The Sentinel tank was a cruiser tank designed in Australia in World War II in response to the war in Europe, and to the threat of Japan expanding the war to the Pacific or even a feared Japanese invasion of Australia. 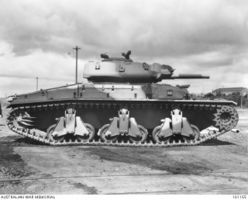 It was the first tank to be built with a hull cast as a single piece, and the only tank to be produced in quantity in Australia. The few Sentinels that were built never saw action as Australia's armoured divisions had been equipped by that time with British and American tanks. When design work began in November 1940, the AC1 was originally intended to be a 2 pounder gun-equipped vehicle, that was intended to be a true Cruiser tank, with a weight of between 16 and 20 tonnes. Due to a lack of home grown experience in tank design a mission was sent to the US to examine the M3 design and Colonel W.D. Watson MC, an artillery officer with many years of tank design experience was provided by the UK. He arrived in December 1940. 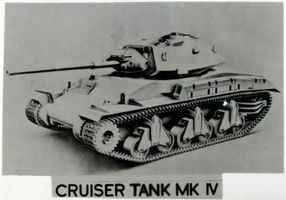 Like the Canadian Ram, the Australian Cruiser was to be based on the engine, drive train, and lower hull of the American M3 Medium tank, mated to an upper hull and turret built closely along the lines of a British Crusader. By 1942, attempting to keep pace with German tank developments, the design specification had become more like an American medium tank, resulting in a heavier design and a higher silhouette profile. The Australian Cruiser tank Mark 1 (AC1) was designated "Sentinel" in February 1942. Manufactured by the New South Wales Railway Company, fabrication took place at Sydney's Chullora Tank Assembly Shops with serial production vehicles emerging in August 1942, the premises also being used as a testing ground. The design used existing parts where available from other tank designs, simplified where necessary to match the machining capacity present in Australia. The hull was cast as a single piece, as was the turret; a technique not used on the hull of any other tanks of the era. The original vehicle was designed to mount a QF 2 pounder this was later changed to a QF 6 pdr (57 mm, 2.25 in). However, none of these were available and the first 65 tanks were built with the 2 pounder. Two Vickers machine guns were carried as secondary armament, one in the hull and a second mounted coaxially beside the main gun. The preferred engines suitable to power a 28 tonne tank, a Pratt & Whitney Wasp single row petrol radial, or a Guiberson diesel radial, were not available within Australia, so the Sentinel was powered by the combined output of three Cadillac 346 in³ (5.7 L) V8 petrol car engines installed in clover-leaf configuration (two engines side-by-side to the front and a single to the rear: all three feeding a common gearbox). Sixty-five production vehicles had been completed by June 1943. An AC3 tank. The Sentinel was to be succeeded by the AC3, a much improved design with better armour protection, and most importantly increased firepower. The next step up in firepower available in Australia was the 25 pounder (87.6 mm, 3.45 in) gun-howitzer. This was quickly redesigned as a tank gun, work that would later prove useful for the design of the Short 25 Pounder. Mounted in a fully traversable turret larger than that of the AC1 but using the same 54 in (1.4 m) turret ring, it was slightly cramped for the turret crew but gave the AC3 both armour piercing capability as well as an effective high explosive round. The hull machine gun and gunner were removed from the design to make room for stowage of the larger 25 pounder ammunition. Powered by the same three Cadillac V8 engines as the AC1, they were now mounted radially on a common crank case and geared together to form the "Perrier-Cadillac",[Note 1] a single 17.1 L, 24 cylinder engine, very similar in some respects to the later A57 Chrysler multibank used in some variants of the US M3 and M4 tanks. One pilot model AC3 had been completed and work had started on producing 25 tanks for trials when the programme was terminated. The completed Sentinel tanks were used for evaluation purposes only and were not issued to operational armoured units. 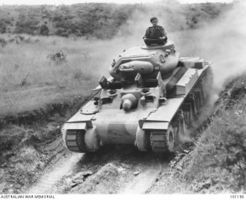 The Australian Cruiser tank programme was terminated in July 1943 believing it better for Australia to put the effort spent on the AC tanks towards building her own railway locomotives and supporting the large number of US tanks due to arrive. The tanks that had been produced were placed in storage until the end of the war. In 1943, the 3rd Army Tank Battalion was equipped with a squadron of AC1 tanks which had been modified to resemble German tanks. These tanks were used in the filming of the movie The Rats of Tobruk. This appears to have been the only time a squadron of Sentinels was used for any purpose. The AC1 Sentinel tank at the RAAC Tank Museum.